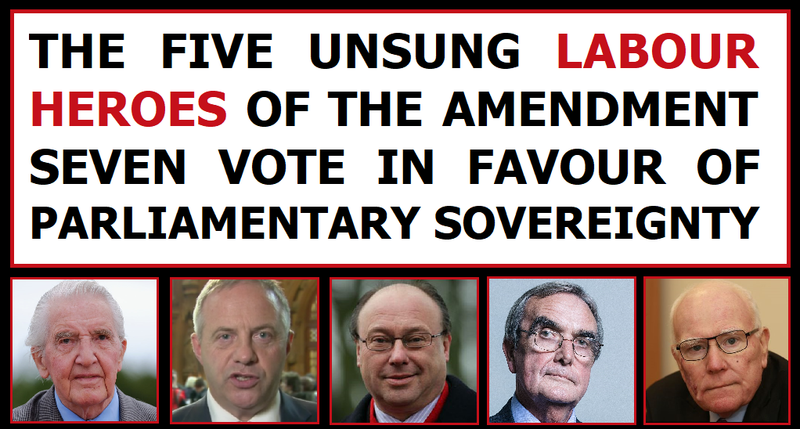 Much credit has been given to the 11 Tory MPs who joined forces with the opposition parties to defeat Theresa May's authoritarian scheming by bravely voting in favour of Amendment 7 to the European Union (Withdrawal) Bill, but there are five unsung heroes on the Labour benches too. Of course the Tory "Mutineers" led by former Attorney General Dominic Grieve deserve credit for having put country above party for once. They'll obviously always be tainted by their numerous votes in favour of imposing ruinous Tory austerity dogma that has done so much damage to the British economy, public services, workers' wages, and productivity, as well as severely retarding the nation's future economic potential through the lowest levels of infrastructure investment in the developed world. However they definitely deserve credit for doing something right for a change, and standing up for the principle of parliamentary sovereignty, especially given the torrent of abuse they knew they'd suffer at the hands of the Daily Mail and the extreme-right for daring to do the right thing. The five unsung heroes on the Labour benches are Dennis Skinner, Graeme Morris, Ronnie Campbell, John Mann and Roger Godsiff. As you may already know, these are all pro-Brexit Labour MPs, but they all made the important distinction between backing Theresa May's objective of turning Brexit into an anti-democratic power grab, and conducting Brexit in a democratic manner. Their ability to make this distinction between an authoritarian Tory Brexit and a Brexit conducted in a democratic manner led them to vote alongside the majority of their Labour colleagues, the SNP, Plaid Cymru, the Lib-Dems and Caroline Lucas of the Green Party to curtail Theresa May's anti-democratic authoritarian tendencies. The vote was won 309-305 meaning that without the votes of these five pro-Brexit MPs the amendment to ensure a proper democratic vote on the final Brexit deal would have been defeated, which would have allowed Theresa May and a tiny cabal of hard-right Tories to conduct the Brexit negotiations purely for their own self-interest, with nobody to hold them to account. 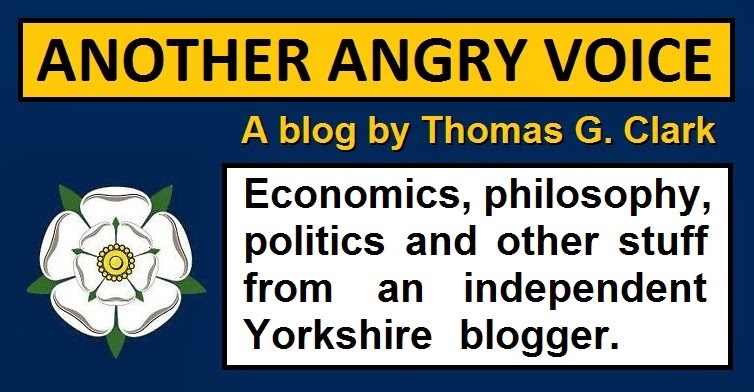 These guys deserve a lot of credit for seeing beyond the outrageously polarised Brexiteer vs Remainer political tribalism and voting for what is actually right, rather than voting tribalistically with their fellow Brexiteers on the Tory benches. In fact two of the pro-Brexit Labour MPs (Kate Hoey and Frank Field) actually voted with the Tories and the DUP to back Theresa May's authoritarian and anti-democratic interpretation of the Brexit mandate, but thankfully they were outnumbered by the five pro-Brexit Labour MPs with enough sense and respect for democracy to support Amendment 7. The sad thing is that if the Tory party wasn't so full of spineless Tory MPs who just did as they were told by the whips and traipsed through the lobby to support Theresa May's anti-democratic interpretation of the Brexit mandate, this vote wouldn't have even been even remotely close. The reality of the situation is that nobody who respects democracy or the principle of parliamentary sovereignty can possibly justify voting against an amendment to ensure that whatever Brexit outcome Theresa May and David Davis cobble together is subject to a democratic vote. So you may well disagree with the pro-Brexit stance of these five Labour MPs, but you've got to admit that at least they're principled about it. They want Britain to leave the EU, but unlike their Brexiter bretheren in the Tory party these five want it done in an open and democratically accountable manner. The final Brexit deal will be subject to a vote in the European Parliament, and then ratification by the 27 national parliaments of the remaining EU states. It would have been beyond ridiculous if Britain was the only country involved in the Brexit negotiations to not have a democratic parliamentary vote on the final deal, but that's the situation Theresa May, the majority of the Tory party and the DUP bigots voted for. As absurd as it is that the vote was as close as 309-305 in favour of defending democracy, it's clear that without the contributions of these pro-democracy Brexiter Labour MPs (and the "mutineer" Tory MPs who got the bulk of the publicity) Amendment 7 would have failed, and the wannabe-tyrant Theresa May would undoubtedly have taken its failure as a mandate to avoid having any kind of democratic vote on the final terms of the Brexit agreement whatever. So if you're opposed to a secretive and anti-democratic Tory Brexit concocted by a tiny cabal of hard-right Tory politicians, take a moment to remember that five Labour Brexiteers played a massive role in preventing that horrifying scenario from coming true.